Ever heard of an apple cider and donut combination? I sure haven’t, but supposedly this combo is extremely popular in Michigan! This week, I left the warm 80 degree temperatures in Dallas and flew up to chilly Michigan to visit my sister, Brittany (check out her blog – it’s called Runner’s Lowe). It’s pretty cold up here and feels like the dead of winter… all the leaves have fallen off the trees, its cloudy and the highs don’t get out of the lower to mid 40s. Burrr! The cold is something us Texans don’t get to experience very often, so I’m having a blast! Besides running, one of the first things Brittany and I did was visit Yates Cider Mill in Rochester Hills (supposedly the best cider mill in all of Michigan). The history of this cider mill dates back to the times of Abraham Lincoln. Yates opened in 1863 as a grist mill. By 1876 they installed a cider press and have been producing fresh, homemade apple cider ever since! They use premium apples that are probably they best I’ve ever eaten! We bought a few Jonagold apples…they are tinny-tiny, but are crisp and have a sweet/tart combination that beats any apple you would buy at the grocery store. Top left: pretty view of the river; Top right: me with some cider and donuts. Bottom left: Brittany and her apples, donuts, and cider; Bottom right: Yates Cider Mill entrance. The apple cider and donuts were awesome! The cider is actually cold, not hot like you might think. It’s kind of like apple juice, but sans all the sugar and it tastes homemade and fresh…without all those preservatives. We ordered the cinnamon sugar donut, which was very good. It was small, and unlike the heavy, dense donuts you might order at a local donut shop, these were light, airy, and were not at all greasy. You could choose between plain, pumpkin, powdered, or cinnamon-sugar donuts. Apple cider and cinnamon-sugar donut. 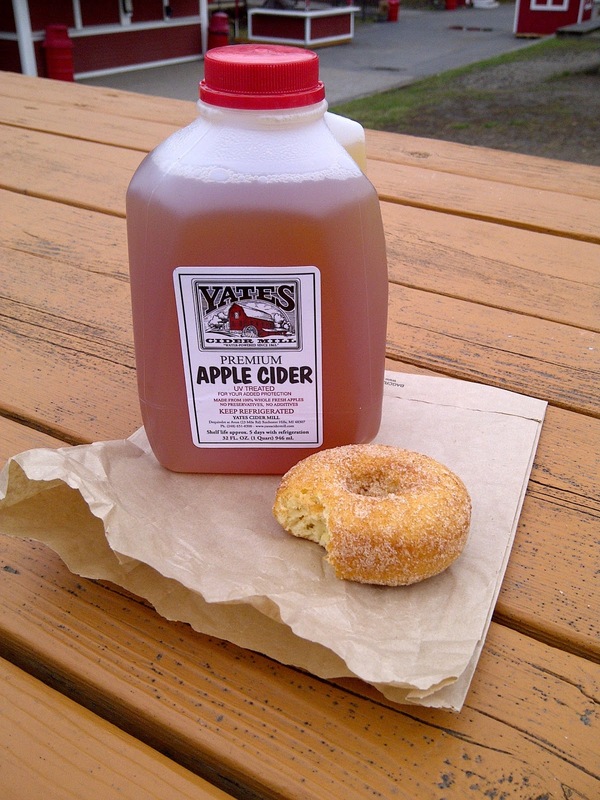 In addition to cider, donuts and apples, you can buy apple butter & jarred goods, homemade pies and baked goods, caramel apples, fudge, and ice-cream. 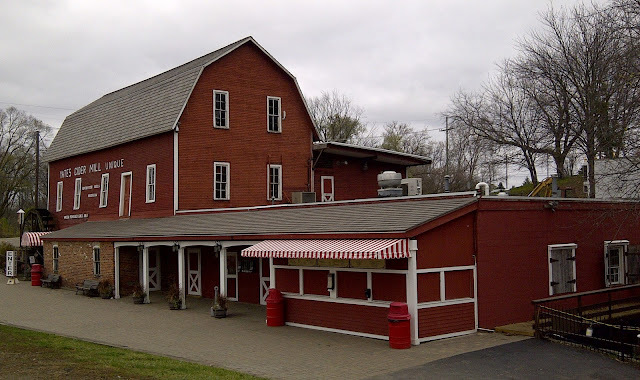 Yates Cider Mills also has a small petting zoo, river walk and offers pony rides! Literally there is something for the whole family! Next time you’re in Michigan, you’ve got to go visit this place. Did I mention Yates was on Food Networks’ Unwrapped? Pretty cool! One Response to "Apple Cider and Donuts in Michigan"
I grew up in that part of Michigan and to be honest, I am having withdrawals from the donuts from Yates. I am hoping maybe you or your sister may have reverse engineered the recipe for the donuts?